Snow Performance Stage 3 Vehicle Specific Boost Cooler - Dezod Motorsports Inc - Home of the automotive performance enthusiast since 2002. 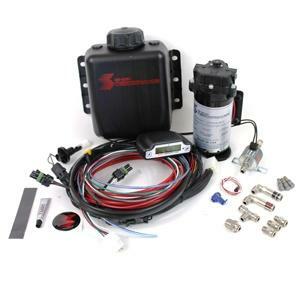 The all new Stage 3 Boost Cooler is the only water-methanol injection system tailored to your vehicle. The Stage 3 creates a 2D MAP based off of boost/fuel pressure sensor voltage to deliver the most accurate and tunable water-meth delivery on the market. Taking it one step further the Stage 3 will control 2 Hyper-Sonic™ Nozzles independently of one another to solidly the exact amount of water-methanol is provided when the engine needs it. This 2D MAP injection results in the most accurate injection curve and tune ability of any water-methanol system giving increases horsepower and torque to your vehicle with out tuning! Tie this in with the industry leading Snow Performance 300 PSI UHO pump, Hypersonic Nozzles™, and terminated weather tight OEM harnessed wiring connections and the Stage 3 promises to be the easiest and most effective water-methanol system tailored to your vehicle.